Who says you can’t control mother nature, The guys at Dropshades can. With their retractable sun control products, Dropshades can lower the temperature on your patio and in your home and cut your energy costs way down, along with taking the suns damaging uv rays completely away therefore creating shade and stopping the sun bleaching on your Furnishings. Dropshades have an array of products to suit all kinds of applications to control the hot sun from hitting your patio and entering your home. The sun emits UV-ultraviolet light that cause our skin to burn and can disintegrate and discolor fabrics, furniture, floors, artwork and many other household items in a matter of months, Dropshades provide a barrier preventing ultraviolet rays and heat from penetrating into the home. Lowering the temperature as much as 40%. Whether interior or exterior block the suns damaging UV rays and scorching heat, you can still enjoy the view with virtually no distortion. At the same time save energy and enjoy lower temperatures Retractable Dropshades are installed over windows, doors and patios. They can be quickly operated manually or motorized They can be fully retracted up or down and partially stopped in any desired position. 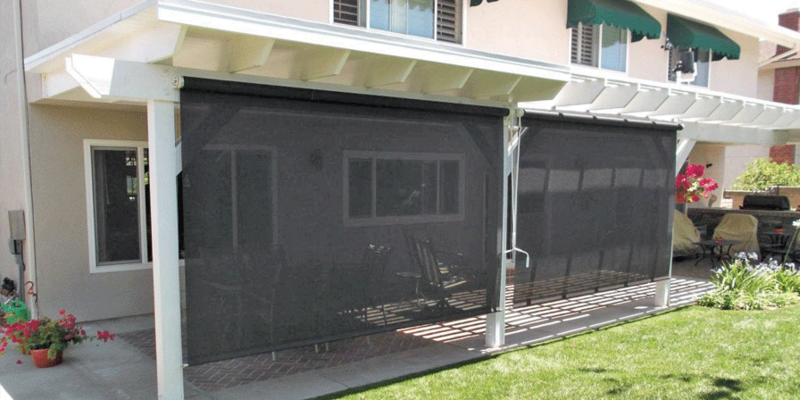 Backed their lifetime warranty you can choose from 60% density up to 100% black out fabric and with sun and wind sensors they can cast shade when its sunny and roll up automatically when its dark or windy. 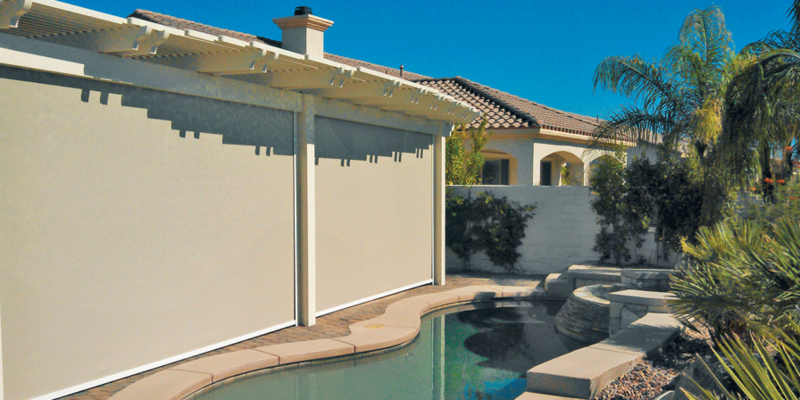 Protects against the suns heat, lowering utility bills and gives great privacy too. 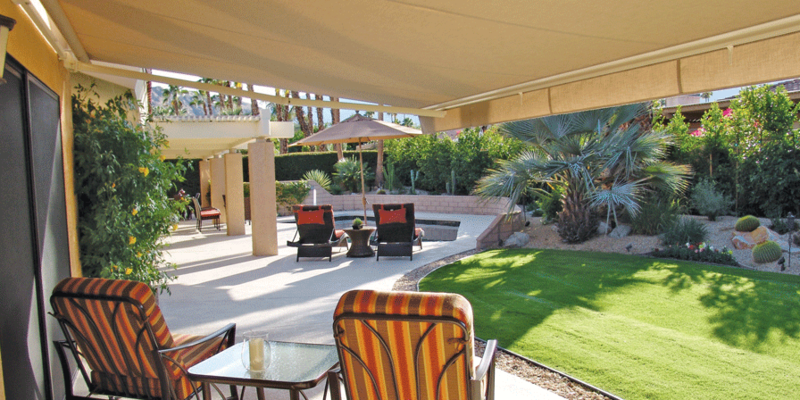 The Emperor retractable awning system from Dropshades is simply the world’s best. The Emperor comes in a wide variety of choices. Seven different frame colors and hundreds of Sunbrella fabric styles, straight valances to scalloped valances, you can design your own Emperor to exactly match your needs. From manual hand cranks to fully motorized, where the awning comes out in the sun and retracts back in when its windy or when the sun goes down. The Emperor can be mounted virtually on any patio, porch or balcony. It will cast shade and extend over an area creating a covered patio affect when needed and fully retract right back against the wall when not needed, with widths far beyond 30 feet, and projections as much as 16 feet. 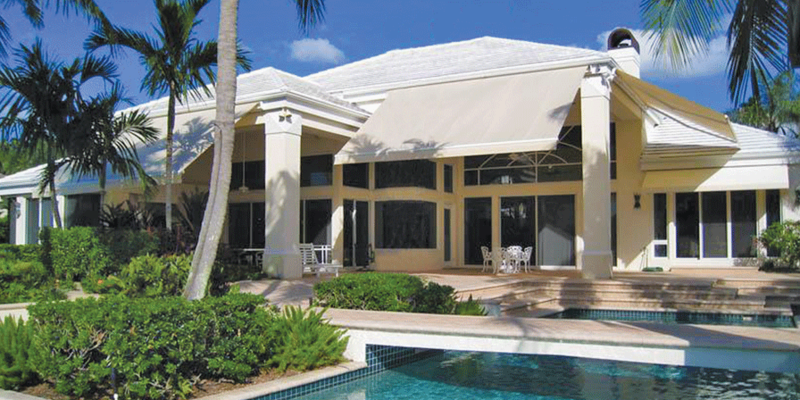 The Emperor is an innovator in the retractable awning industry with the best and the longest warranty in the industry. 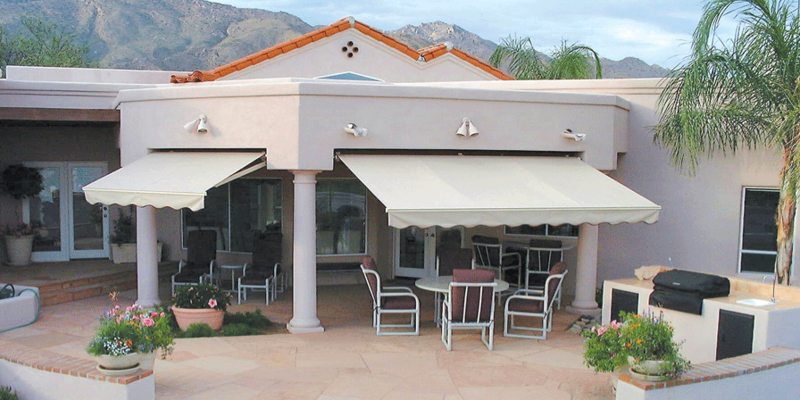 Dropshades are manufactured here locally in the Desert. You can save $$$ by buying straight from the manufacturer and have very little wait time. Buy where the dealers buy from, cut out the middle man and buy straight from the manufacturer. 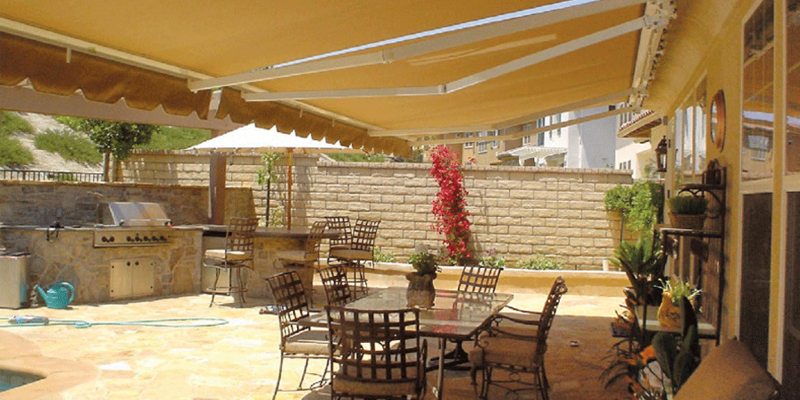 Purchasing a retractable awning or a Dropshade is an investment. Before making a decision to buy a retractable awning or a Dropshade learn as much as possible, go to their showroom, make sure you’re not buying from a guy who works out of his garage or his back yard, it’s like buying a new car you wouldn’t buy a new car without seeing it first. Find out where they are located go see their shop, see the difference between quality and craftsmanship. Dropshades have got you covered. Dropshades beautiful showroom and manufacturing facility is right here in the Coachella Valley in Palm Desert right across the street from Sun City on Washington Street. Go see the quality of what you’re purchasing.